An increase in interconnectedness owing to a rise in the supply of Treasury bills is offset by improved profitability and less risk taking. The Bank Policy Institue Conditions Index (BPIBCI), which provides an analytical and concise measurement of the condition of the U.S. banking system, was roughly unchanged in the first quarter of 2018 and continues to show an extremely resilient banking system, reflecting in large part the very strong capital and liquidity positions of U.S. banks (Exhibit 1). Last quarter, the index registered a decline in profitability and capital driven by changes to the U.S. tax code, specifically, the reduction of the value of deferred tax assets and the repatriation of overseas earnings. This quarter, profitability recovered as a result of the lower corporate tax rate, and the liquidity and risk aversion categories also increased their degree of resiliency. In contrast, financial institutions became slightly more interconnected due to an increase in primary dealer positions owing to a rise in the supply of Treasury bills. Notwithstanding, the BPIBCI remains well above the level that maximizes the contribution of the index in tracking future GDP growth, suggesting that risk-aversion by banks or banking regulations continue to be holding back economic growth somewhat. Exhibit 2 depicts the heat map of BPIBCI for each of the six categories that comprise the aggregate index. Values near 100 (higher resiliency) are shown in blue while values near 0 (higher vulnerability) are shown in red. Overall, the changes in each of the six subcomponents of the index – capital, liquidity, risk-aversion, asset quality, interconnectedness and profitability – were mixed in the first quarter of 2018. In particular, risk aversion, liquidity and the profitability categories showed improvements in their degree of resiliency. In contrast, interconnectedness experienced a decline in the degree of resiliency this quarter. Lastly, the capital and asset quality categories of the index were about unchanged relative to the previous quarter. 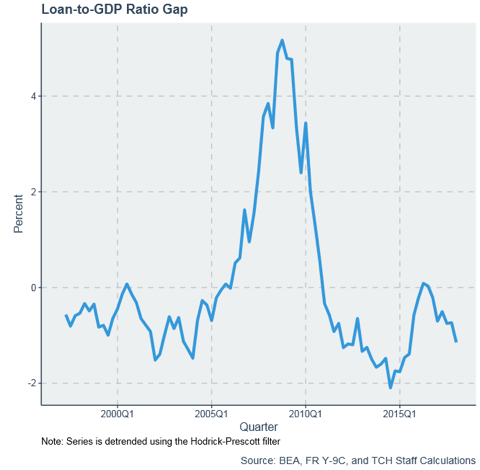 The increase in risk aversion was mainly driven by a decline in the loan-to-GDP ratio gap, shown in the left panel of Exhibit 3. Currently, the gap is well below its long-run trend and declined further in the first quarter of 2018 signaling a lackluster growth rate of loans relative to the size of the economy. Headwinds arising from tighter banking regulations have likely continued to put downward pressure on loan growth, particularly on loans to borrowers with less-than-perfect or insufficient credit histories. That said, total loans grew at an annual rate of 5¾ percent in the first quarter of 2018. The increase in resiliency observed in the liquidity category was driven by a decline in the gap between the maturity of assets and liabilities held by banks. The maturity gap had been rising since the end of 2014, and a recent TCH’s blog post discussed the possibility that the Fed’s stress tests were incentivizing banks to hold longer-term assets, such as longer-term fixed-rate government securities, to improve their performance in the stress tests. The share of assets financed with short-term wholesale liabilities also declined slightly this quarter. In summary, U.S. banks continued to have highly liquid balance sheets and sizable liquidity buffers and banks’ share of high-quality liquid assets remained very elevated. Meanwhile, bank profitability recovered due to the reduction in the corporate tax rate, an increase in noninterest income and net interest margins, but remained still somewhat subdued relative to historical standards. As shown in the right panel of Exhibit 3, the decrease in resiliency of the interconnectedness category was driven by an increase in exposures to financial entities, defined as the ratio of loans made to other depository institutions, repos and federal funds sold to total assets. 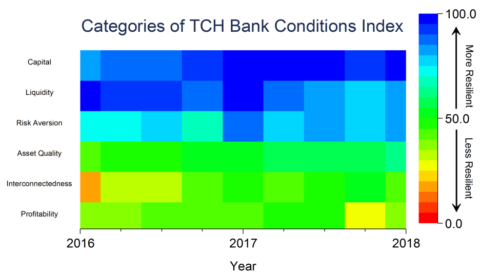 According to several industry reports and discussions at a recent TCH symposium on money market conditions, the increase in interconnectedness is in most part driven by an increase in repo balances at primary dealers as they provide financing for an increased supply of Treasury bills. The capital category was about unchanged in the first quarter on net. Market leverage under stress rose markedly as a result of a reduction in the dynamic correlation between each bank and the market index, however, it was offset by a decline in regulatory capital ratios due to an increase in risk-weighted assets under the standardized approach. In addition, accumulated other comprehensive income – which is part of common equity tier 1 capital for the advanced approaches banks – also declined due to a rise in longer-term interest rates. The asset quality subcomponent was also little changed this quarter. An improvement in the non-performing loans ratio, reserve to loans and reserves to non-performing loans ratio was almost offset by an increase in net charge-offs. Finally, Exhibit 4 provides the readings on each of the six categories that comprise BPIBCI at two different points in time: (i) the end of 2008, the nadir of the past crisis and (ii) the most recent quarter. Points plotted near the center of the chart indicate a high degree of vulnerability in that category while points plotted near the rim indicate high resiliency. As shown by the red line, in the fourth quarter of 2008, the quarter immediately after the failure of Lehman Brothers, almost all categories of the aggregate index were at very low levels indicating the presence of acute vulnerabilities. Over the years since the crisis, almost all categories of the index have improved considerably, as shown by the blue line, especially the capital and liquidity positions of U.S. banks. These improvements largely reflect the efforts of banks to increase their capital and liquidity following the financial crisis, the more stringent capital and liquidity requirements that are part of Basel III, living wills, improved risk management and the U.S. stress tests. 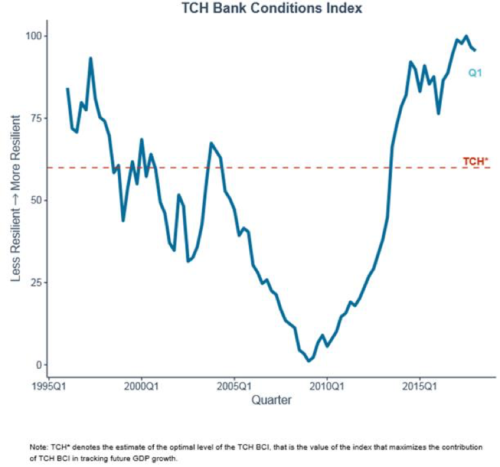 The Clearing House introduced Bank Conditions Index at the end of 2016 in order to provide a quantitative assessment of the resilience of the U.S. banking sector using a wide range of common indicators of bank condition and updates the index at a quarterly frequency. 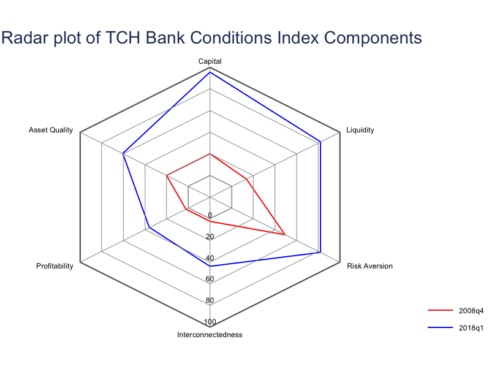 The index synthesizes data on 24 banking indicators, grouped into six categories: capital, liquidity, risk-aversion, asset quality, interconnectedness and profitability. The aggregate index assesses the resilience of the banking sector from the first quarter of 1996 to the present (first quarter of 2018) on a scale of 0 to 100. 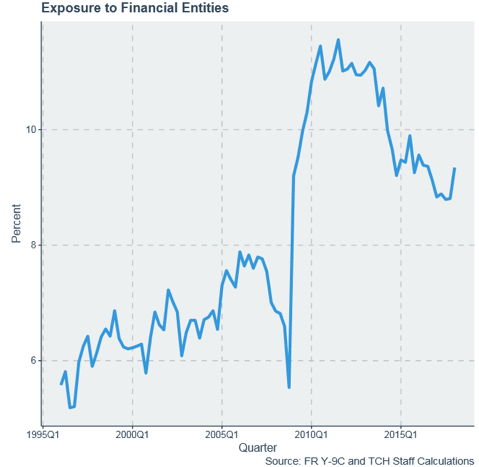 A value of 100 indicates that the banking sector is at its most resilient since the first quarter of 1996; conversely, a value of 0 implies that the U.S. banking sector is at its most vulnerable. Although a value of 100 is associated with a maximally resilient banking system, it is probably not the level most conducive of robust economic growth. On the one hand, having extremely safe banks is desirable from a financial stability perspective as vulnerabilities in the banking system amplify and propagate adverse economic and financial shocks, resulting in severe and persistent economic downturns. On the other hand, a banking system that is excessively risk-averse will also have an adverse impact on economic growth over the medium and longer term by restraining credit to borrowers that are bank-dependent (e.g., small businesses) and via higher lending rates on loans to all types of borrowers. We find that GDP growth is at its highest when the BPIBCI is about 60 (see the dashed line in Exhibit 1). Currently the BPIBCI is close to 100, suggesting that bank caution or banking regulations could be holding back economic growth.